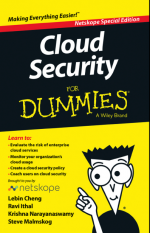 Thanks for listing “Cloud Security for Dummies” from Netskope as the Cloud Book of the Month! I work for Netskope and have the pleasure of working with these authors. If you have any questions, please don’t hesitate to reach out via https://www.netskope.com/contact-us and we’d be happy to answer them.